Polystyrene systems are one of the fastest growing cladding systems in the ACT region. With the highest thermal performance available from a cladding product, you will soon see why. Building Innovation Centre are the leading supplier of RMAX polystyrene systems within the ACT region. From external wall cladding to underslab insulation and wall insulation, we have expert knowledge and stock a large range of different products, enabling our customers to complete their job on time and within budget. RMAX Thermawall® – is a CodeMarked complete insulated Cladding system comprising of a selection of high quality components that are fully integrated and have been specifically designed to compliment each other at every stage of construction to produce consistent and outstanding results. 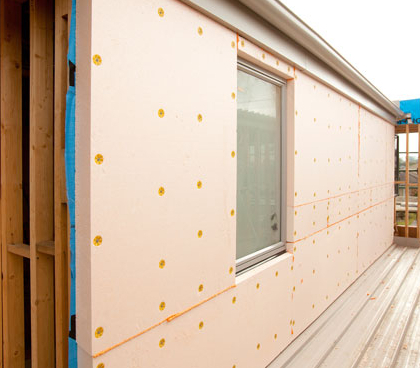 RMAX ThermaSlab® – is a high performing EPS (Expanded Polystyrene) insulation panel. ThermaSlab® is designed for use in both commercial and domestic applications and is installed under the ground slab. RMAX ThermaAdvantage® – is a foil insulated expanded polystyrene (EPS) board suitable for internal or external insulation. It is an effective combination of proven RMAX EPS insulation with the addition of reflective foil backing.